I went to my local store last week and found several varieties of squash on sale. It’s time to look around and ask, “Which one shall I cook today” I’ve always been drawn towards butternut squash. I think I love it more for the colour and shape rather than anything else, but I must say it tastes really good too. The one I dread most is the acorn or pepper squash, which is mainly roasted or microwaved, because there is always this debate on weather the skin is edible or not because it can be hard and tough sometimes. Anyway, I love this soup because it takes only a few minutes to make and it’s basically seasoned with salt, pepper, garlic, ginger and a glug of double cream. I love the addition of smoky bacon for “garnish” is it really a garnish or a clever way of sneaking in some meaty ingredient? I enjoy eating this soup and I hope you’ll do to. Enjoy the rest of the week!!! 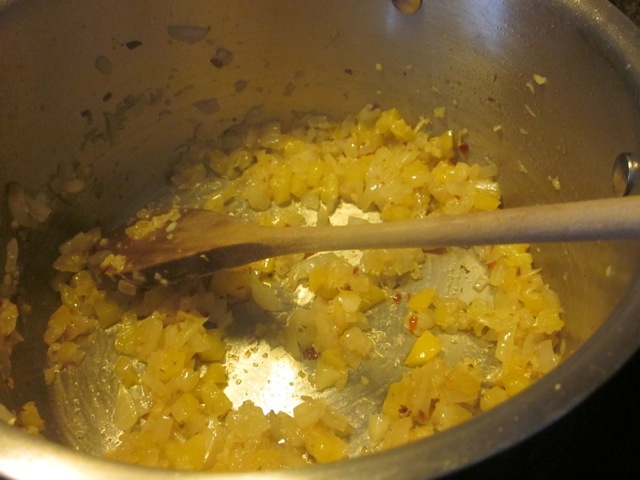 Add onion, garlic, ginger and bell pepper to the rendered bacon fat and cook gently for 5-10 minutes until soft. Add squash and 3 cups stock bring to the boil and simmer 15 minutes or until squash is tender. Blend or process to a puree. If the soup is too thick add a little more stock. and serve, topped with bacon. Cook the bacon until crisp. Drain and set aside, keep warm. Add squash and 3 cups stock bring to the boil and simmer 15 minutes or until squash is tender. Blend or process to a puree. If the soup is too thick add a little more stock. Return to the pot, add cream, adjust seasoning and serve, topped with bacon. 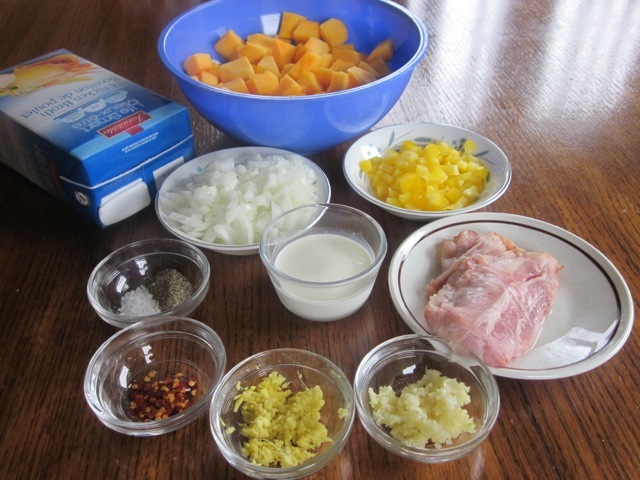 1 cup chopped squash is about 150g (5oz). You’ll need about 1 scant cup broth for every 200g butternut squash. I am so glad your squash hating son loved the squash soup. How wonderful. I always feel over the top when my kids love the food I make, so I know how you feel right now. Thanks so much for giving me a feedback and do have a very pleasant day. My best regards to all of them. Butternut squash is my favorite ingredient in any application. It even makes a great cake! Oh thanks for reminding me that I can use it in cake. I am totally going to try. Have a fantastic week! I am so sorry I took so long to respond to your lovely message. I took a break and when I came back there were so many pending messages, I didn’t know where to start. It was so overwhelming and now I’ve started my routine posting and cooking which eats a chunk of my time. I have thoroughly enjoyed reading your story. Thanks so much for making the soup and for transporting it to share with others. I’m glad your granddaughter had fun and niece loved it too. I hope she enjoyed it for lunch. I love a kick of pepper in soups too so that was a great idea. Thanks so much, Cecile. You’ve made my day. I wish you a fantastic week! I totally agree with you. I was bit disappointed by the colour of my soup, but loved the taste. I had a lot of yellow peppers that needed to be used immediately. Next time I shall try red. Have a wonderful day, my friend! Omg I wish I could take a walk along the beach too, totally awesome. Have a fabulous day! I like a butternut squash soup, this was looks gorgeous. Thank you. I see you’ve been posting like crazy. Have a fab week ahead! Yum. I adore anything with bacon fat in it (terrible as it sounds, but it’s delicious!) 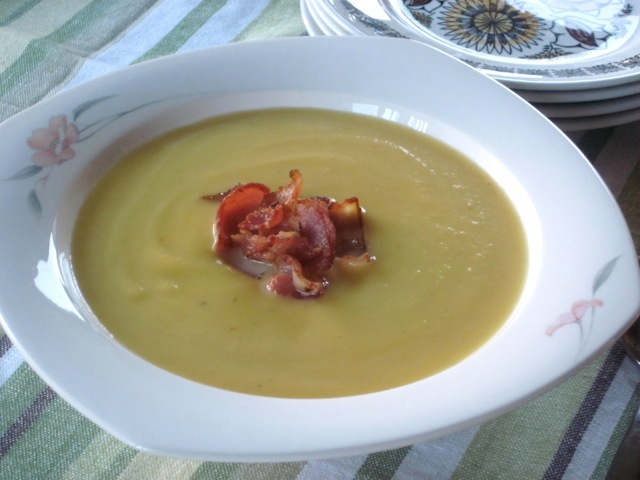 and I can imagine how good this soup would taste with the salty, savoury bacon and sweet butternut squash. I can understand why it’s one of your favourites Liz! Thanks for visiting after a long spell of silence. How is Australia? I bet the weather is good and life is good too. Bacon is so good, even though it has that unhealthy looking fat! ha ha have a lovely weeK! Mmmm, that sounds sooo good, Liz! thanks, Dave. Just glimpsed the fog cake. It looks delicious! 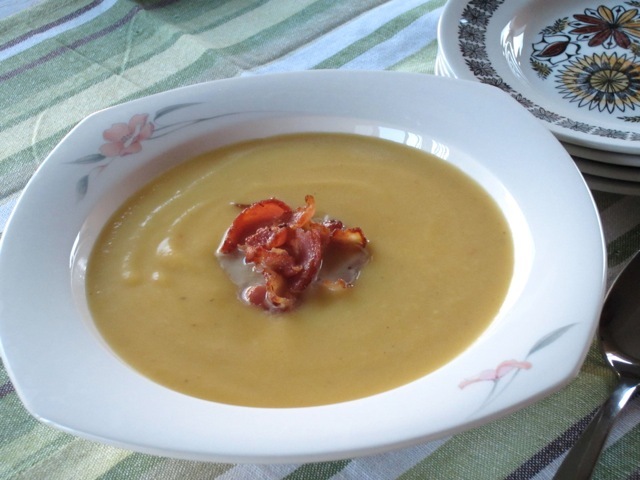 Oh I totally love bacon in my soup. Scrumptious…thanks for visiting me. I wish you a fabulous week! Ha ha I love the hurrah…and the fact that you had all the ingredients. Did you make the soup? Have you posted the chicken liver pate made with cream and brandy? I look forward to seeing it. Have a fantastic week! best wishes! I bet you found my looong comment about The Traveling Soup after you sent this reply!! 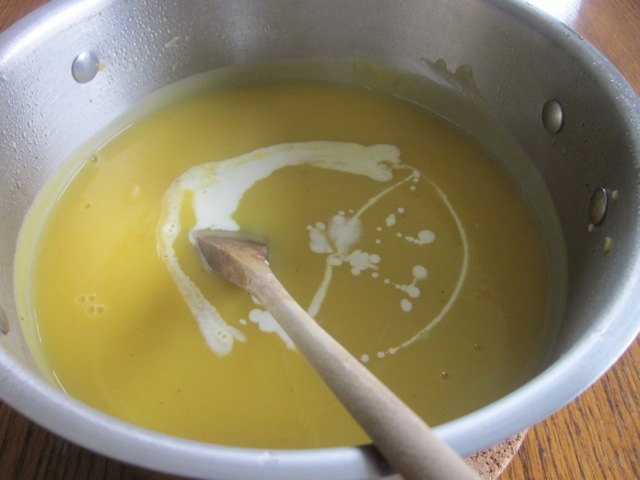 I LOVE THE SOUP – it seems everyone loved it !! 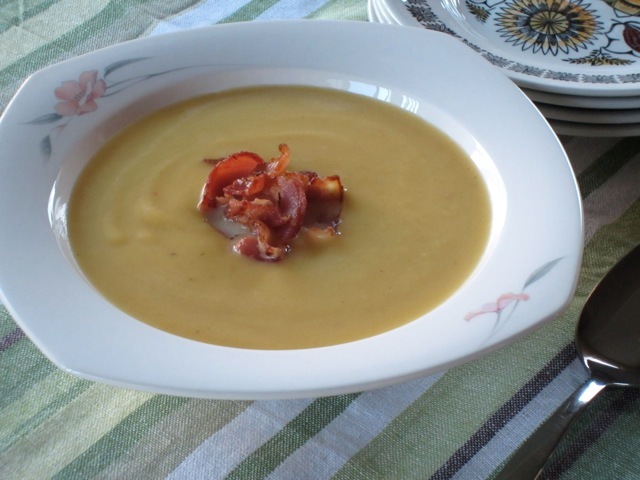 That soup is now officially on my ‘Need to Make This Often’ list ; o ) (Yesterday I found a recipe for Butternut Squash Soup with Apples – I want to try that one as well.) And I DID post the recipe for Pâté with Brandy and Shallots – check it out!! I like the idea of Need to make often List” I am certainly borrowing the idea. I am so thrilled that everyone loved the soup. I adore soups. 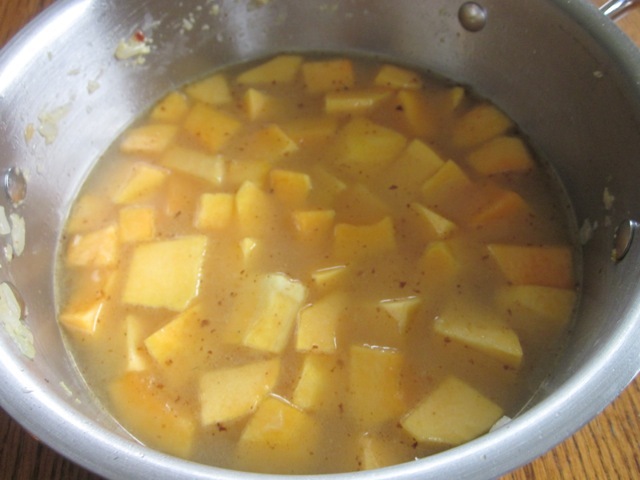 Please share the recipe for the apple-butternut squash. It sounds like a great combination. I wish you a happy week and yes I saw the Pâté. I need to step up and make some Pâté too! Don’t I love bacon too….oh yes more than words can say!!!! Looking seriously yummy! I love the thickness! Thank you and enjoy the rest of the week! Yum! I love butternut squash soup. The bacon garnish is perfect! I am so looking forward to fall foods. Unfortunately my winter squashes aren’t doing so well in the garden…somebody is eating the blossoms off. I fear a slow squash crop this fall. Guess I’ll just have to buy it, I was so looking forward to yummy veggies from my garden. I am so sorry to hear that. What a pity. Gardening is a hard nut to crack. I hope next year you’ll have better luck. My best wishes to everybody! Thank you. I hope you find time to try it!!!! 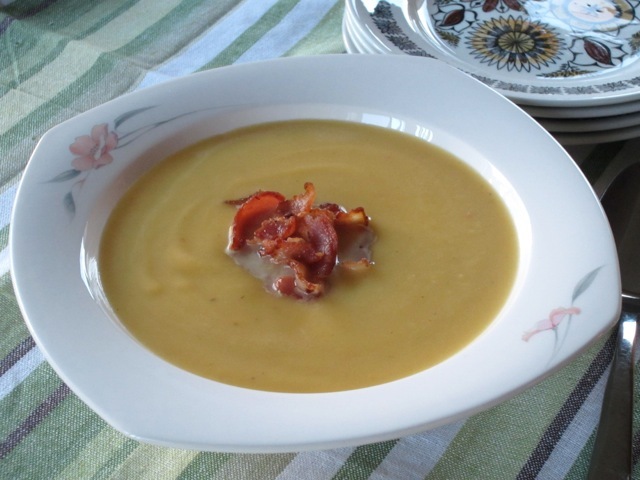 Love Butternut squash…… I have a variation of this one using Candied bacon…….. Thanks for posting this one. Candied bacon sounds delicious. I would love that too! Me too. How do I make the candied bacon or should I just dip it in melted chocolate? thanks for sharing! 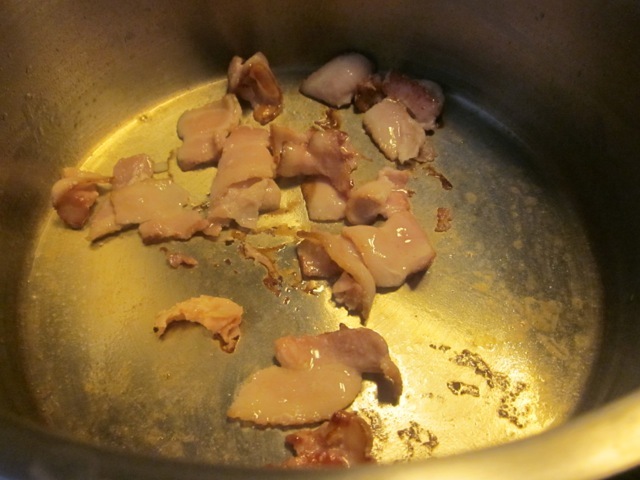 “Put bacon slices in a bowl, season them with pepper and toss with the brown sugar. Cover a baking sheet with parchment or foil and arrange the bacon in a single layer on top. Sprinkle any sugar left in the bowl over the bacon. Top with another layer of parchment or foil and top it, squarely, with another baking sheet. The baking sheet will flatten the bacon as it cooks. Thank you so much for the detailed instructions. I look forward to some extra crunchy and sweet bacon. At what temperature should I bake? Thank you so much, Paul. I shall be trying over the weekend!!! Wish you a happy Thanksgiving! I am going to the store and get these ingredients right now, how wonderful! Did you reach the store? How was it? I hope you loved it!!!! Looks lovely Liz! I love acorn squash. I usually bake it with a dab of butter and a light sprinkle of brown sugar. Tastes fantastic. 1/2 acorn per person. But I really like Butternut squash too and particularly in soup. It just has such a lovely rich flavor. When I was in Australia – Queensland Blues were a favorite. What you do with them is poke some holes, throw the whole thing in the oven to bake, Cut in half, scoop out the seeds and serve as is – a delicious vegetable on the plate. I brought some seeds back one year and we had 3 fairly good size ones, kept the seeds but they are fickle lovers, not necessarily coming true to variety, they will cross pollinate with anyone! I really like this recipe and am going to try it! Hope you are having a lovely day? You know there so much acorn squash in the local store right now I am totally going to try your simple method of baking, with some honey garlic chicken wings on the side…I have just googled the Queensland blue. It looks like something out of a fairy tale. what a pity that it cross-pollinates with anyone. I hope you found time to try the recipe and thank you so much for being such a humble and gracious lady. I am so grateful I met you, Sandy, I hope one day I’ll see you in person! The one on the salad photo? Ha ha I am going to post them soon…how is autumn? No, the one about the butternut squash soup. I have spaghetti squash cooked in the refrigerator, but I don’t think it would make a good soup. Any cheese-y buttermilk biscuit gets my vote! Spaghetti squash does not make good soup, I agree. I love cheesy buttermilk biscuits too!